2019 started off with two things: an upbeat sentiment towards the upcoming Lok Sabha elections, and the recent #10YearChallenge which has just started off on Social Media, which challenges people to post two photographs of themselves ten years before and a current one. Our political parties have taken a step forward in comparing the actions of their rivals with the same challenge. 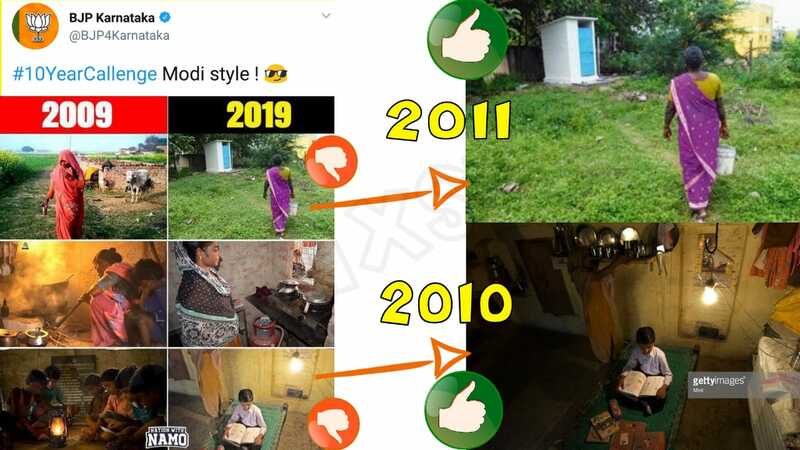 The image has a set of 6 photos, three on left under 2009, and three on right under 2019 explaining how much has changed in last 10 years under the Narendra Modi government. Also, Facebook page Nation With Namo posted the image with the hashtag #10YearChallenge. 10 year challenge, Modi style. This post has had 4800 likes and approx 3000 shares so far. Out of three shown as of 2019 actually are almost a decade old. After digging extensively, this image, which is claimed to be of 2019 is ACTUALLY a 2010 photograph. These photographs were clicked on 24th February, 2010. A small background: This photograph is a part of a set of photographs which was taken by Priyanka Parashar, a photographer with The Mint, when she had visited Bazida Jattan village in Haryana’s Karnal district The photograph has also been used as a representational image in many other articles which talk about electricity in India. This image is also up for sale in GettyImages along with the others clicked. A simple reverse image search on Google shows that this image is not from 2019, but has been used in various articles on sanitation as well, as a representational image. Moreover, the source of this image is from a LiveMint article dated 21st October 2011 which talks about Hyundai Motors building toilets in Irungattukottai village of Tamil Nadu’s Kanchipuram district as a Corporate Social Responsibility activity. The image used is a representational image for many articles on rural life in India and energy for cooking. A reverse image search on Google, Yandex and TinEye helped us find this out. There was no exact source of this image. Moreover, this is a representative image for this article which was written in 2013. On doing a Google Image search, we found out that this image was taken out of a 2018 article from DownToEarth.org.in, a website which talks about agriculture, climate and governance. This article talks about Swalia Bibi, a slum dweller in Bhubhaneshwar, the capital of Odisha, and the 20th Million beneficiary of the Prime Minister Ujjwala Yojana cooking gas distribution scheme, who is not able to afford LPG cooking gas cylinders because of the steep rise in monthly expenditure. This image is a representational photograph which first appeared in an NDTV article in 2011 which talks about the usage of solar power to electrify villages in Bihar’s West Champaran district. We found this image’s source through reverse searching on Google, Yandex and TinEye. This photograph has also been used as a representational image for many other articles and journals which talk about the generation of electricity. ← Did dancers perform to “Sandeshe aate hai” in America’s got Talent ? No order on UP Gov Officials to send their children to Gov Schools yet by CM Yogi Adityanath. This is from Aug 2018 and this celebration had been happening since 2013. November 10, 2018 Hoax Slayer Comments Off on This is from Aug 2018 and this celebration had been happening since 2013.